The Phillies haven't been making all that great of moves lately and perhaps that lack of insight is showing in the ballclub. One of the most exciting players to come out of the Philllies minors should have been travelling with this team to Atlanta to open the season with this team, but somehow the most obvious decision was reversed. 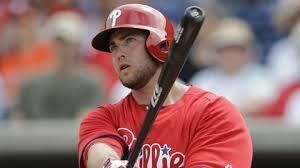 That player that should have opened the season with the team of course would be Darin Ruf. Ruf proved to the Phillies that he was more than ready to play baseball in the big leagues but somehow the easiest decision that should have been made by the Phillies brass was flubbed. Here is a player that has blazed a trail and set it on fire, he only broke Ryan Howard's minor league home run record last year, earned the nickname 'Babe Ruf', and then turned around and went into winter ball just a few months ago and smacked a whole bunch of home runs to prove his is no fluke. How about 2 game ending walk-off home runs in the past week or so down in Florida that Ruf hit to give the Phillies 2 wins? You think this guy can play some baseball? What more does a player have to do in the Phillies farm system? You have to believe that the Phillies are trying to 'do the right thing' by Ruf with sending him down to the minors but there is just no real justification in it, it's just plain dumb. The reason was so he can play more outfield, hell, he could do that right down at Citizen's Bank Park, and it wouldn't be the worst thing to happen to this team in the past year or two. The way this team has mismanaged it's younger players is pretty poor, imagine the Phillies with a guy like Mike Trout in their system, he wouldn't the the light of day in the majors until he was nearing 30 years old. "What more does a player have to do in the Phillies farm system?" Probably be able to catch a baseball.